This our fathers bought for us long and long ago." and saw action in both Korea and Vietnam. 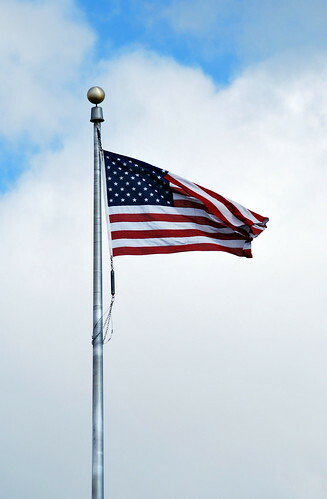 for this country and for me. I should have told you that more often when I had the chance. 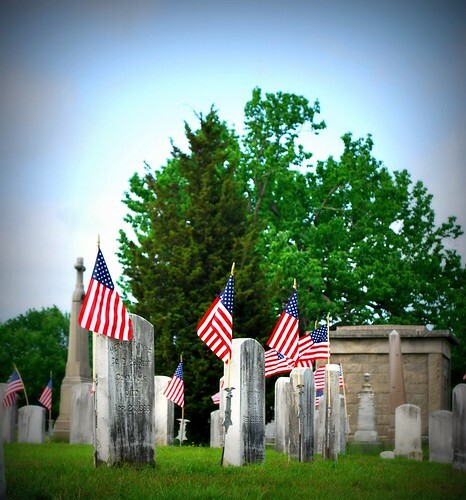 For me, Memorial Day is not complete without a visit to at least one or two cemeteries to pay my respects to the veterans interred there for whom this holiday has been dedicated. 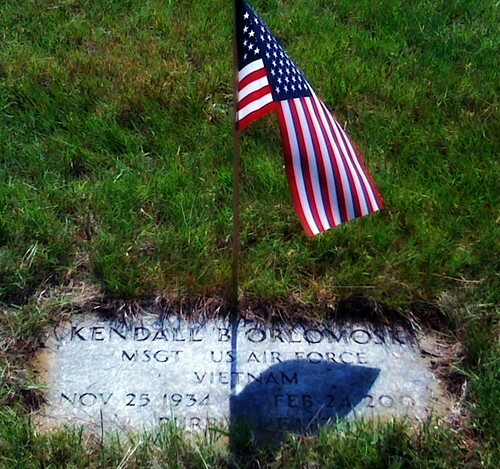 Considering that they chose to serve in our nation's military to make our country the free land that it is today, it seems like the least I can do is visit their graves and say "thank you". 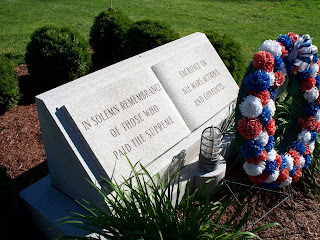 After all, isn't that what Memorial Day is all about? As most of you know, I live within very close walking distance to what I call my favorite cemetery in Norwich - the Yantic Cemetery on Lafayette Street - so it was to there that I headed on Saturday afternoon being that I am working both Sunday and Monday of the holiday weekend and didn't want to pass by the chance to go and then not get there at all. 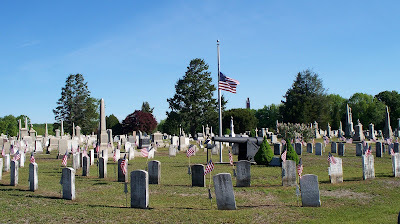 When I got there I was a little dismayed to find that the City of Norwich had apparently decided that sprucing up the cemetery for the holiday weekend wasn't high on their list of things to do. What was high, though, was the grass! Seriously wicked high! 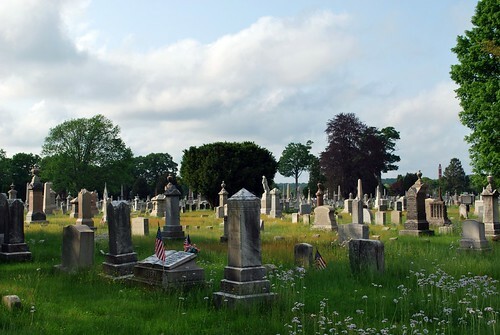 I would think that the city would be embarrassed to have visitors coming to one of its more prominent cemeteries on Memorial Day Weekend with it looking as it does but maybe they figured that no one would notice. Yea ... right ... wrong! 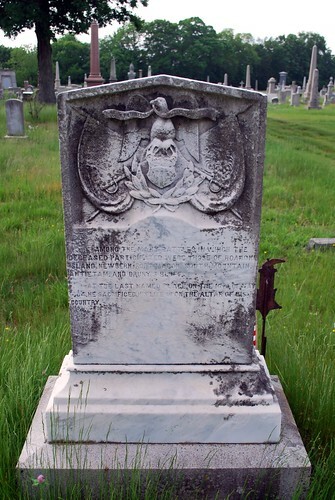 Regardless of the fact that I felt like I was wading through a sea of grass to get there, I made my way to the back of the cemetery and the grave of Lieutenant Marvin Wait whose family must have had money as he has a rather elaborate stone. Definitely not your standard military issue. On each side of the stone are listed the major battles that Lieutenant Wait fought in before he met his death far from his home in Norwich at the very young age of 19. 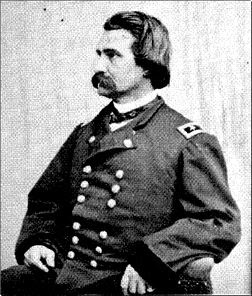 Lieutenant Wait died in the horrific battle of Antietam which took place in Sharpsburg, Maryland on September 17th, 1862. 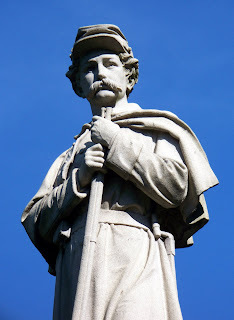 It was was the first major battle in the American Civil War to take place on Northern soil and was the bloodiest single-day battle in American history with about 23,000 casualties - one of which was Lieutenant Wait. 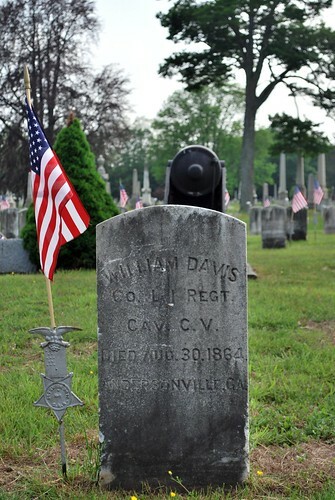 "In Memory of Lieutenant Marvin Wait Co. A 8th Regt Conn. Vol. "He died with his young fame about him for a shroud." Thank you for your service, Lieutenant Wait. 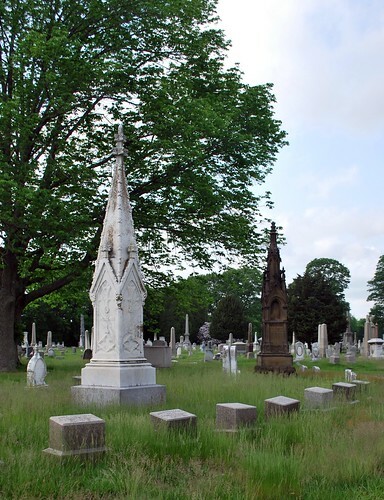 Across the cemetery can be found the stone of Captain John McGall who died at the slightly older but still young age of 28 during the Bermuda Hundred Campaign in Chesterfield County, Virginia on May 16th, 1864. A member of the 8th Regiment just like Lieutenant Wait, I've got to wonder whether they knew each other in spite of being in different Companies within the Regiment. 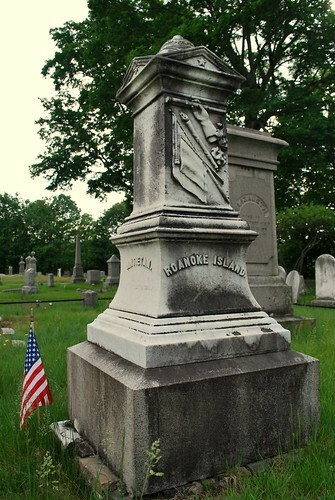 "Among the many battles in which the deceased participated were those of Roanoke Island, Newbern, Fort Macon, South Mountain, Antietam, and Drury's Bluff. 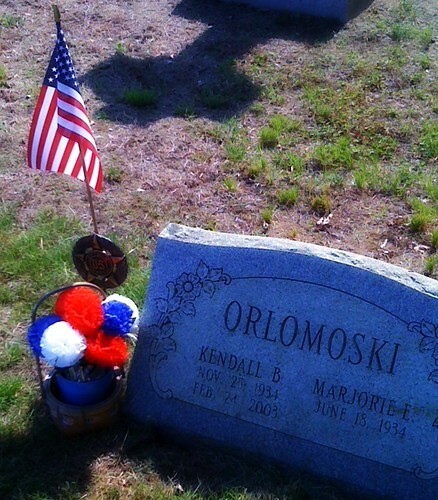 At the last named place on the 16th of May 1864 he sacrificed his life upon the altar of his country." 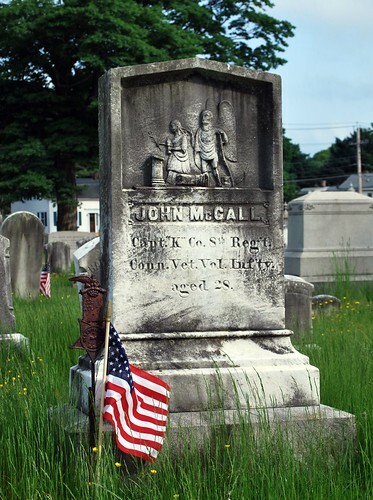 Thank you for your service, Captain McGall. 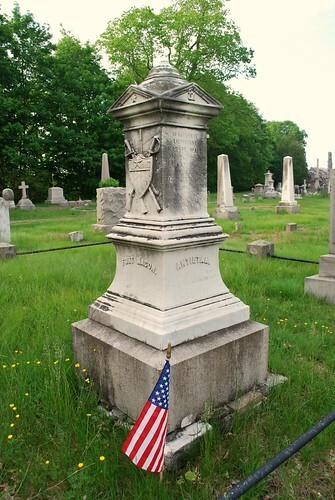 Nearby the grave of young Captain McGall is the Andersonville Memorial Gun with its concentric circles of soldiers' graves surrounding a 30-pounder Parrot rifle mounted on an iron cage. 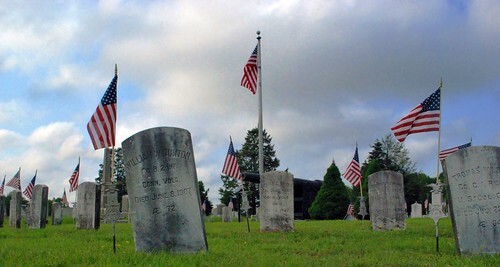 This spot in the Yantic Cemetery is dedicated to Norwich's native sons who died at the Andersonville Prison Camp in Georgia. 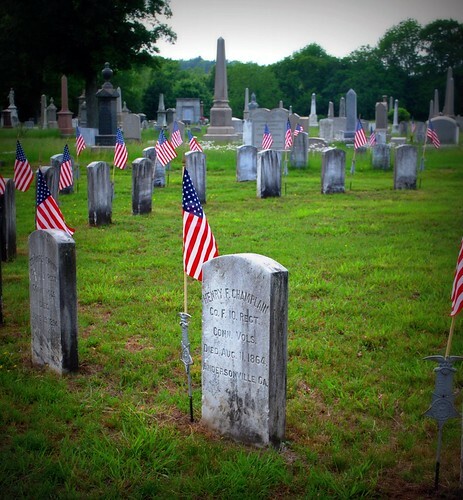 Thirty men from Norwich were Prisoners of War at Andersonville and of those thirty, fifteen died from starvation, exposure, disease, or execution. 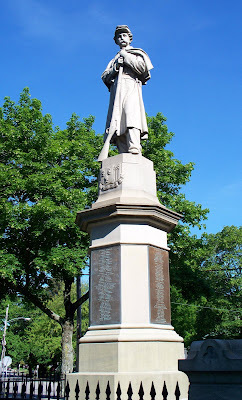 In early 1866 Norwich became the first Northern city to retrieve the bodies of its soldiers who had perished there when they brought back the remains of nine of the fifteen soldiers who could be identified. 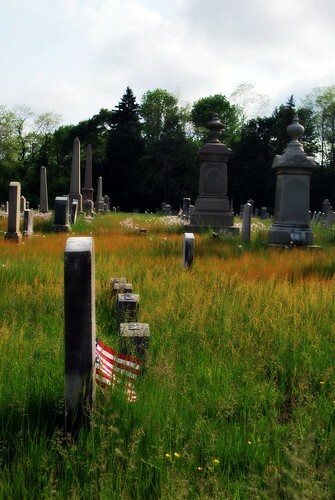 A public service for their re-interment was held on February 1st, 1866. 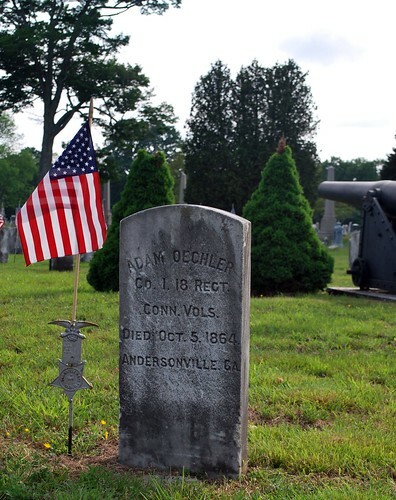 In addition to the nine soldiers from Andersonville, there are 62 other members of the military who served in other wars and campaigns buried at the veterans plot with the last burial occurring as late as 1925. Thank you for your service, gentlemen. 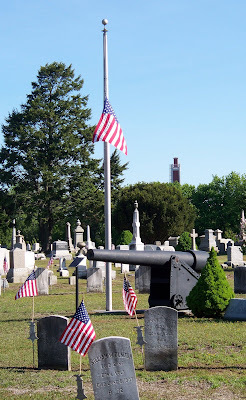 I was glad to see that the City of Norwich had at least taken the time to make sure that the grass around the Andersonville Memorial Gun was cut and that new flags had been placed at all of the graves. 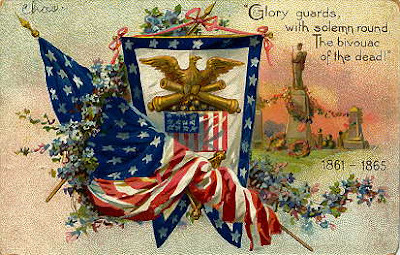 As I looked at all of the weathered white stones with their new flags circling the Andersonville Gun and full-size American flag, I thought that it was nice that all of these brave men were buried together so that they'd continue to have the camaraderie that only those who have served in the military know. As they stood united in life, they now rest united in death. It just seems fitting. 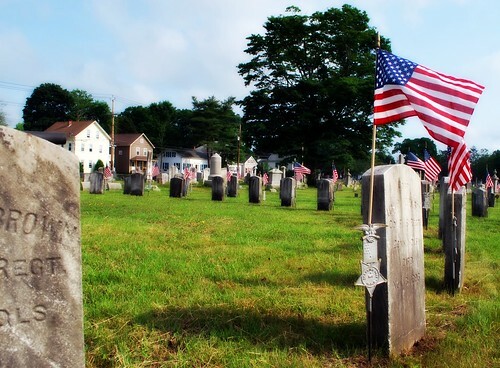 As we continue through this Memorial Day Weekend, I'd like to ask once again that you remember those men and women who have fought and died to keep our nation free. 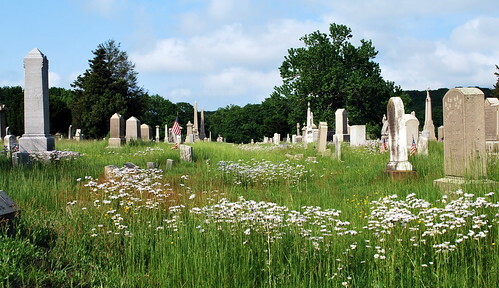 Even if you don't get a chance to visit a local cemetery, send your thanks heavenward - I'm sure they'll be heard. The past couple of weeks I've been thinking a lot about the lies that people tell: big lies, little lies, exaggerations, lies of omission, embellishments, noble lies, white lies, emergency lies, fabrications, perjury, bluffing, half-truths ... the list goes on and on it seems. We tell these lies not only to each other but also to ourselves: "No, those jeans don't make you look fat." "You have a beautiful singing voice." "This car has never been in an accident." "The check is in the mail." "The roast wasn't dry at all." "I had to work late." "I'm never going to have that much to drink again." "I won't ever hurt you." "Traffic was horrible." "I have always told you the truth." "I won't ever let myself get hurt again." ... Sadly it seems like sometimes it's pretty hard to tell the difference between where the truth ends and a lie begins. As lying seems to be such a big part of society these days, it only goes to follow that there are lots and lots of songs where lies or lying are the main theme so I had no problem putting together a set list for this week's Five on Friday meme using that very theme. A lot of times these playlists seem to go where my mind and/or mood wanders and considering my mind has been following paths of deception lately trying to figure out in which direction things are going to go, this just seemed like a natural choice. So ... enjoy this week's five songs as there are some good ones in there. Honest! I wouldn't lie to you! 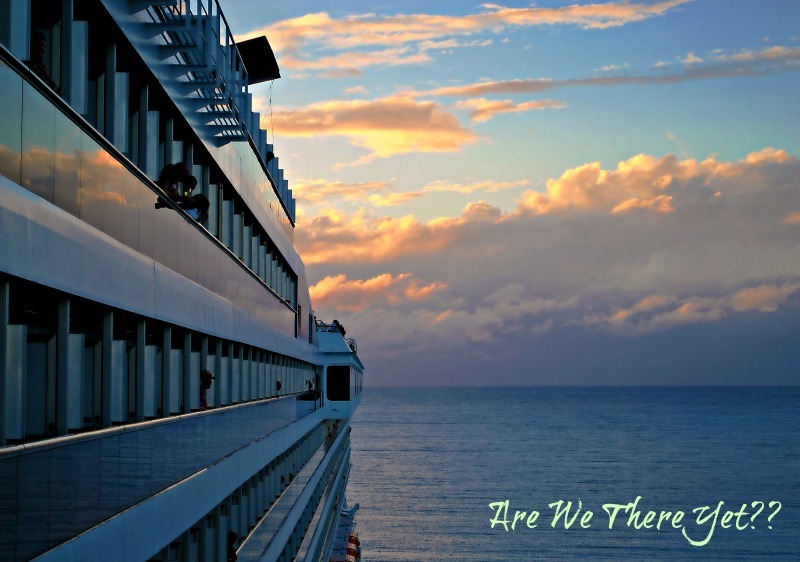 If I translated that correctly then in English this post is titled "Working For the Weekend, Part Two" ... if I translated it incorrectly then your guess is as good as mine as to what this post is titled! My middle-school French is nothing if not rusty but to be perfectly honest, it was non-too-good even when I was trying to conjugate French verbs in 7th and 8th grade! 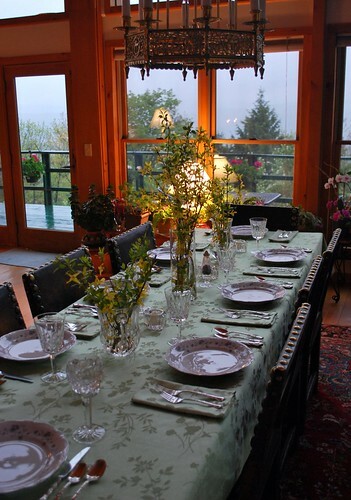 Anyhow poor foreign language skills aside, I left off my post yesterday about our Working Weekend at the Inn Victoria just before Jamie and I were to head out with six other folks to the mountainside home of the Gilberts for an evening of French food and friendship. Those who weren't heading out were going to be dining on steak and lobster at the inn so either way you looked at, it was rather a win-win situation and quite the treat after a day of painting, cleaning, planting, and the like. Along with Denise and Dave and Sally and Fred, the lone "paying" couple that was staying at the inn for the weekend were also going to be joining us for dinner. Sarah and Matthew were visiting Vermont from Syracuse, New York as Matthew's brother was going to be graduating from a college in Norwich, Vermont on Sunday and in addition to that they were celebrating their first anniversary and the completion of Matthew's Master Degree in Engineering. When two other people opted to not go to the Gilberts for dinner, an invitation was extended to Sarah and Matthew and they happily accepted. 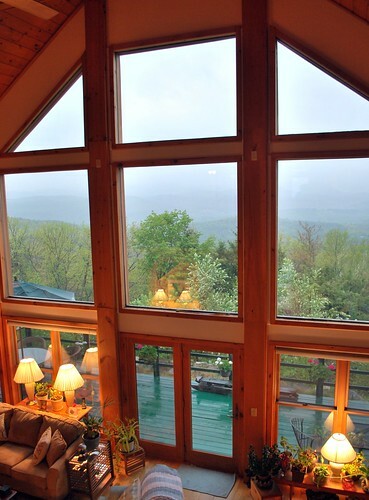 After getting a bit turned around with the directions, we arrived just a little late (along with Fred & Sally) at an absolutely gorgeous mountainside home that - had the visibility been better - would have most likely taken our breathes away. 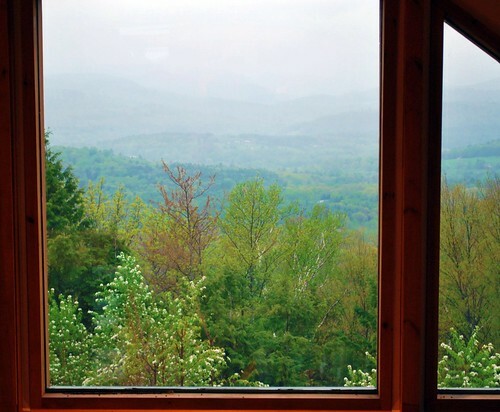 As it were, we were only able to make out a little of the scenic view from the massive windows that looked out towards the west but even a cloudy view was gorgeous. 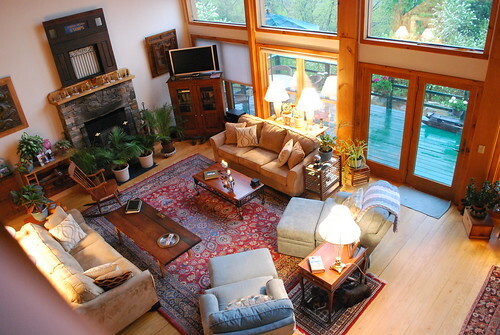 The Gilberts - Townsend and Carol - had designed and built the house themselves and their obvious pride of ownership was evident throughout their home. They had hoped to serve dinner outside on the deck however Mother Nature had other plans but that was okay as the table looked warm and inviting and the perfect size for a dinner party. 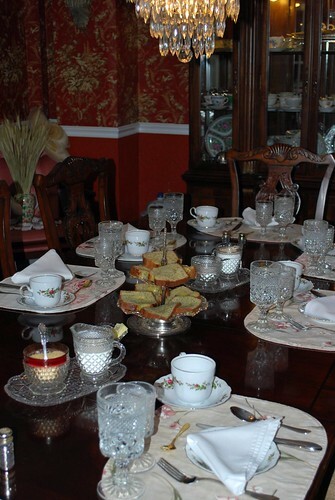 Townsend explained that the table had been in his family for many, many years and that it was narrower than most dining tables so that people could relax and speak to each other without having to yell across the table. 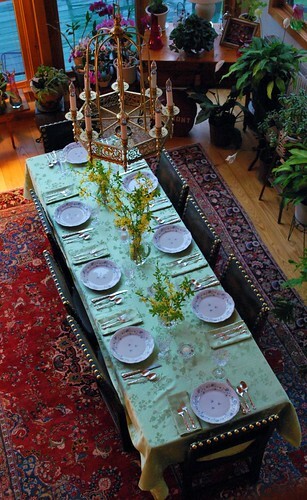 The forsythia that decorated the table had come from bushes outside of the house and in addition to that Carol had a beautiful collection of orchids that seemed to thrive very well in their corner of the dining room. Having had only one orchid in my entire life (Andrew gave it to me as a birthday present one year) and having managed to kill it way too soon, I told Carol that I was really impressed with how beautiful her orchids were and said that they must love the view from the windows as much as she and Townsend do. 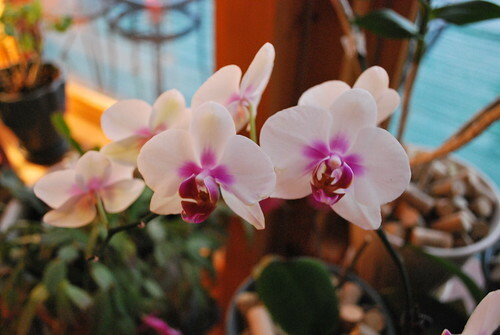 Turns out, though, that you don't have to have a mountainside home in Vermont to grow beautiful orchids ... you have to have lots and lots of corks! 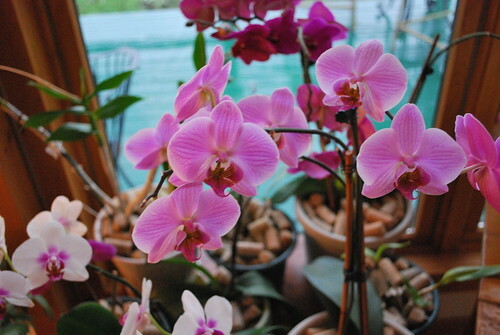 Carol told me that she had learned a secret awhile back in that orchids grew very well when you planted them in corks and not soil - lots and lots of corks! Apparently their roots like to grab onto things and corks are perfect! Who knew?? Well I do now and if I ever get another orchid I'll know better how to give it the perfect living environment! 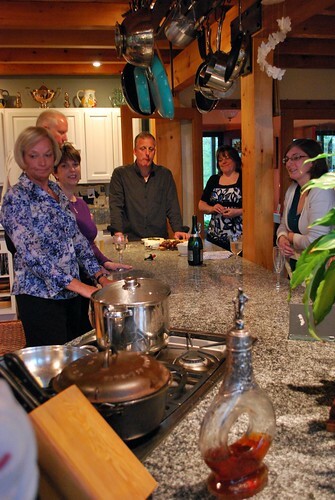 Following our tour of the house and fruit and cheese for appetizers along with some fabulously delicious champagne, we took our seats at the table and prepared to be treated to a wonderful dinner prepared by Townsend and Carol. The dinner had actually been part of a community auction and as a way of saying 'thank you' to us for attending the Working Weekend, we were the lucky recipients of a gourmet meal. The weekend really didn't seem much like work when we were getting treats like this and the gourmet breakfasts we were fed at the inn - not to mention the gorgeous rooms we got to stay in! Jamie and I sat at the end of the table furthest from the kitchen which gave us the pleasure of sitting close to Matthew and Sarah who turned out to be fantastic dinner companions. I've got no doubt that had I been sitting nearer to Dave & Denise or Fred & Sally that they would have been equally entertaining but considering that both Matthew and Sarah turned out to be followers of Doctor Who as well as knowledgeable in movies like Sherlock Holmes, Inception, and Shutter Island I had no trouble talking to them at all. When Matthew found out that we watched Doctor Who he happily announced to Sarah, "Honey, they're Whovians!" While Matthew and Jamie discussed Marvel comics, Sarah and I talked about the lousy weather we'd all been having in addition to a myriad of other topics that I've got to credit having teenagers for in being able to converse about. I think Amanda would have been proud of me! 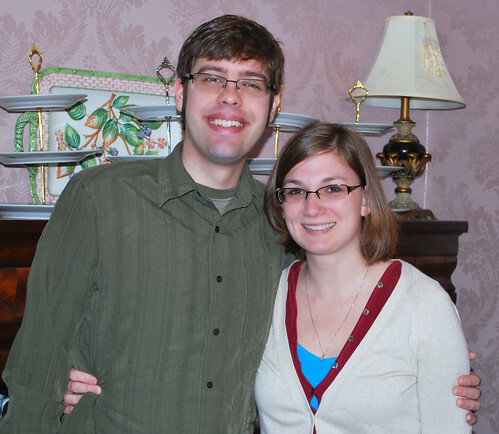 Matthew was an admitted geek being that he attended Rensselaer Polytechnic Institute where he majored in engineering and he's currently working for Lockheed-Martin in Syracuse. Sarah has a degree as a guidance counselor but she's currently working in a health-related field as she hasn't yet been able to get a job in guidance. She's hopeful though and after talking to her, I'm sure she'd make a great counselor if/when someone is smart enough to hire her. They were married on May 8th - the same day as my friends Frank and Dawn - so we toasted their anniversary just a little late and wished them many, many more. As I wasn't smart enough to take their picture Saturday evening, I convinced them to pose for me on Sunday morning before they left for his brother's graduation. Aren't they just the cutest couple? Really, really nice people and it was a pleasure to meet them and share the evening with them! Oh, anyway, back to dinner itself! 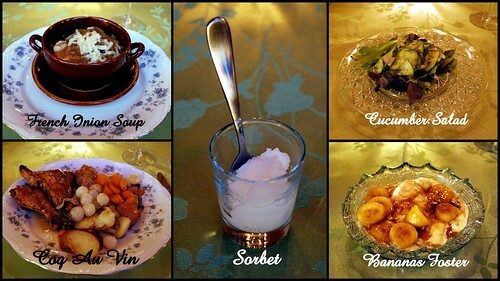 Dinner was served in four courses with the first being Jamie's very favorite - French Onion Soup. A darned delicious French Onion Soup, too! After that we cleansed our palettes with a little bit of Lemon Sorbet before moving on to the Main Course which was a delicious Coq au Vin with potatoes, carrots, pearl onions, and mushrooms - yummy! Following the French tradition we then had a light cucumber salad before being served Bananas Foster for dessert. Not wanting to seem too much like a crazy person I tried to take pictures surreptitiously as possible which meant keep the flash off! After all, I don't think anyone there was too familiar with the whole concept of blogging and how we like to take pictures of our food - one of the reasons I didn't bring my camera to breakfast with me on Saturday morning - so I was trying to appear as normal as possible! 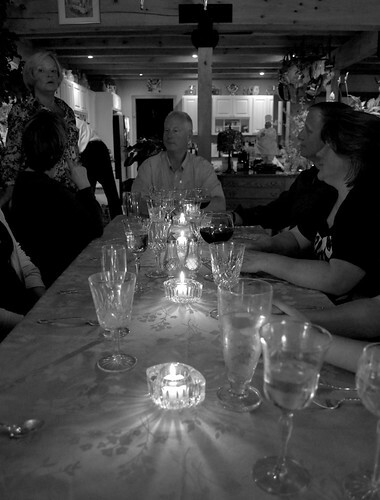 The end of the meal found us all quite comfortably full but not like when you know you've eaten way too much and can barely push away from the table and we all sat around the table and talked like we were all old friends. Good food, good wine, and good company made for a great combination and it was a very pleasant evening all the way around. Thanking Carol and Townsend profusely for their hospitality, hugs were given as we all took our leave to head back to the Inn Victoria where we found the rest of the "work crew" waiting up for us in the living room to hear how our dinner had been. At that point, the long day and more wine than I usually drink caught up to me and I couldn't wait to get up to our room and call it a night. Jamie decided to stay up and catch up on some computer time but I think I was asleep within moments of my head hitting the pillows. Eight a.m. arrived way too soon but knowing that there was a delicious breakfast to be had, we made our way downstairs to the dining room where the table was beautifully set beneath my gleaming chandelier. Honestly, I need to stop going to these lovely little bed & breakfasts that serve these out-of-this-world breakfasts as I could very easily get quite used to such lavish treatment. 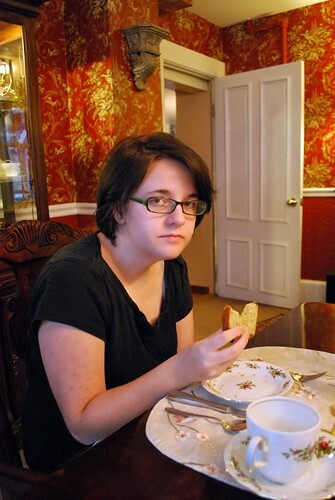 The breakfasts that I've had at both the Captain Lord Mansion and the Inn Victoria sure make my usual breakfast of oatmeal or granola and yogurt pale horribly by comparison and to have coffee that actually tastes like coffee ... a girl could really get used to that sort of thing! This time I brought my camera along for breakfast so that I could show you just what we were being served as if the post I'm going to do about the Inn Victoria on The Distracted Wanderer doesn't convince you to put it on your list of places you need to go, the pictures of breakfast most definitely will! 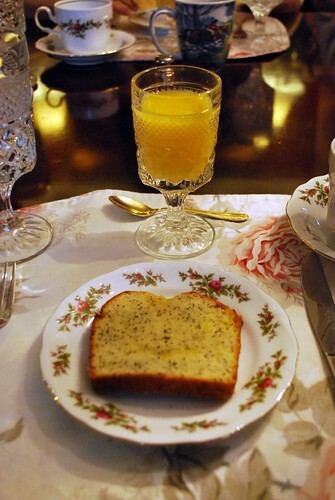 We started out with fresh orange juice and some of the best Lemon Poppy Seed Bread I have ever tasted. 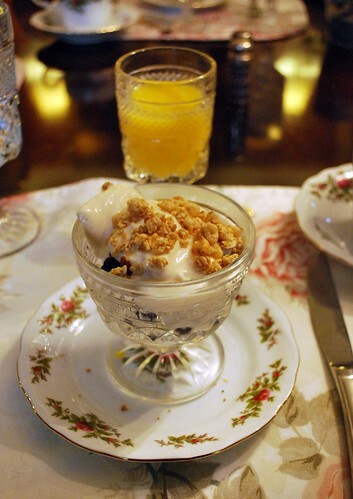 That was followed with fresh yogurt and granola over blackberries and blueberries - delicious! 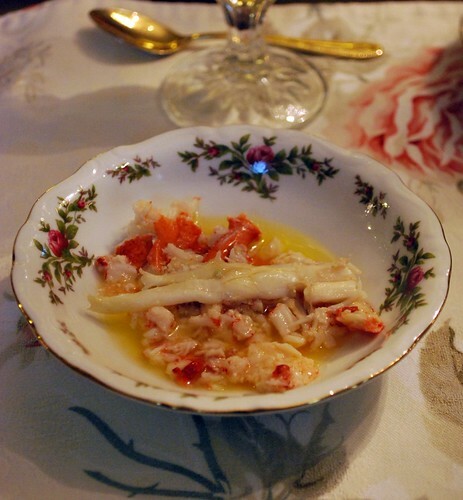 For those of us who had missed out on the steak and lobster the night before, Dan served us each up a small dish of lobster in drawn butter that just melted in your mouth. Not a usual breakfast staple, of course, but boy was it good! 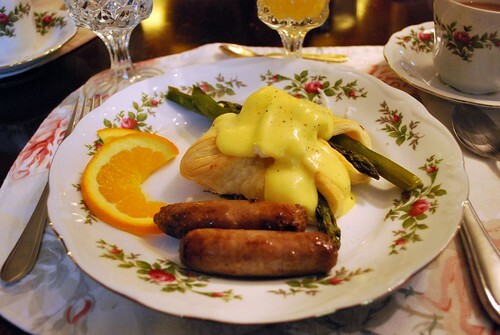 And then the Pièce de Résistance of breakfast - Eggs Benedict with fresh tomatoes and asparagus over a puff pastry with sausage on the side. My mouth is watering again just looking at the picture! If I had thought that breakfast was unbelievably good on Saturday - and it was, it was - there were no words to describe how good breakfast was on Sunday. Seriously good. Seriously really, really good. 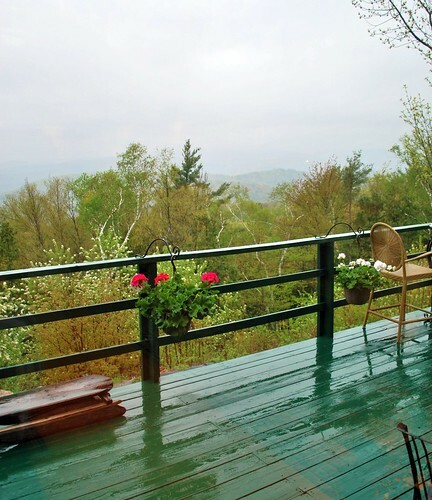 I need to go back to Vermont good! Unfortunately Jamie had woken up with a bit of a migraine so even though she did make it down to breakfast she only had tea with her bread and some sausages as she just wasn't feeling like eating. She has no idea what she missed. 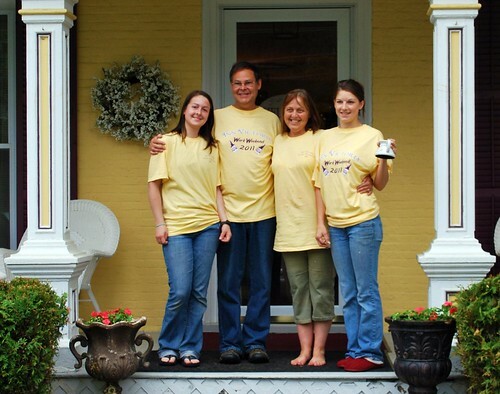 I had hoped to stay and do a few more small jobs around the inn before we left to head back to Connecticut but with Jamie not feeling good at all, I told Penny that I was afraid we were going to have to leave a little earlier than I had originally planned. She was very understanding though I really felt like we needed to stay and help out more in order to pay Dan & Penny back for the wonderful weekend that we had enjoyed. Still, having had migraines myself when I was younger, I knew what Jamie was going through and she really just wanted to get in the car and sleep on the drive back home - which is exactly what she did only waking up when I pulled into the driveway over two hours later. 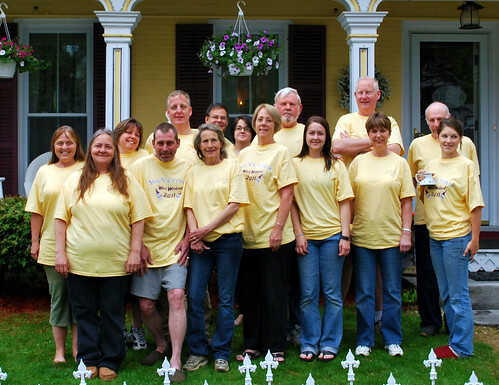 The 2011 Inn Victoria Work Weekend Crew! I sure hope that next year when the Inn Victoria's Work Weekend rolls around that I'll be sitting at my computer when the email comes in again as if they'll have me, I'd love to go back up and do it all over again - with or without my youngest in tow. Penny kept saying how blessed they were to have such a good group of workers come up and do so many of the things that they weren't able to do on their own but in all reality, I really think that it was the rest of us who were blessed and I am very glad to have been a part of it. Thank you ALL so much for a wonderful weekend in a wonderful inn in a wonderful town!